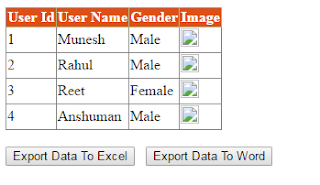 Here we will learn How to export grid data into Excel And Word . Add an aspx page and write the following code on .aspx Page. <asp:Button ID="btnExportToExcel" runat="server" Text="Export Data To Excel"
<asp:Button ID="btnExportToWord" runat="server" Text="Export Data To Word"
Now run your application and see the output and perform operation On Gridview.